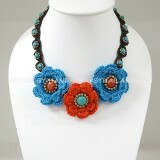 Details: Crochet Flower Necklace Length 18" Width 1.5 cm. Weight about 80 grams. .. Details: Brass Beads Necklace With Teardrop Pendant Length 18.5-19 inches Weigh.. Details: Brass Beads Necklace With Turquoise Teardrop Pendant Length 18.5.. 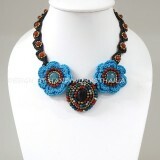 Description: Crochet necklace with agate stone. Round wide 3.7 cm. Length total 19-20.. 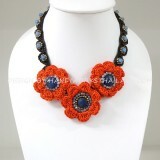 Description: Crochet necklace with agate stone. Main wide 4.5x3.7 cm. Round wide 3.2x.. Details: Silk Flower V-Shaped Necklace Width 12 - 16 cm. height 17 cm. (excluding cable) .. Details: Howlite stone choker necklace. Weight 50 grams (Approx.) Material.. Details: 3 Line freeform stone necklace Length 19-21" Weight 40 gr.. 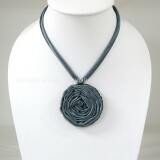 Description: Silk flower necklace Tie a long string You can adjust the length by yourself. ..